These home-made, natural fruit popsicles are a perfect recipe to beat the heat on a hot, sunny day. They are much healthier than the popsicles that you buy from the store because they are made from 100% fruit and all-natural ingredients. 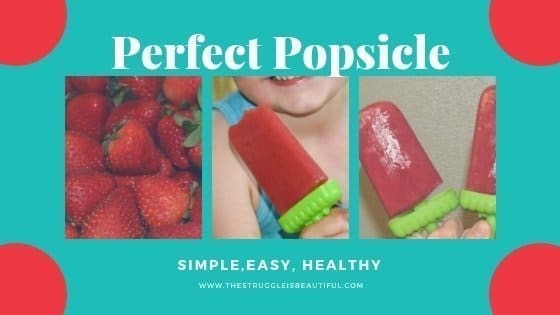 This fruit popsicle recipe has absolutely no added sugar, and it’s super easy to make with only 5 MINUTES of prep time. 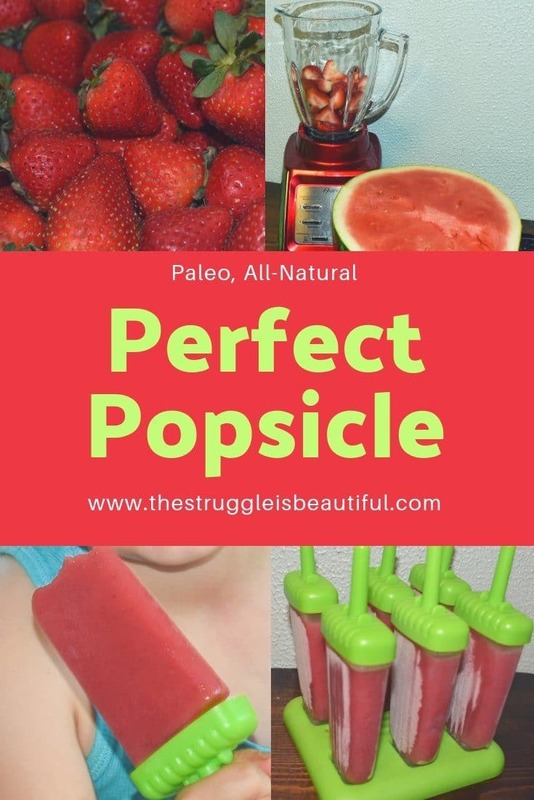 Tired of store-bought popsicles that fill your kids up with high fructose corn syrup, and artificial colors and flavorings? Most popsicles are riddled with ingredients mothers all told to avoid, but a sweet, cold, popsicle running down their hands on a hot summer day is an American kid rite of passage. This recipe is made with 100% fruit and only takes about 5 minutes for me prepare. My kids love them even more than the sugary alternatives from the store, and I get to give my kids a treat without any guilt. I hope you love these guilt-free all natural fruit popsicles! You only need 4 cups of fresh fruit, a blender, and some popsicle molds. I used these molds from Amazon. This recipe makes the perfect amount to fill them and they seem quite durable. If you already have popsicle molds, you can just use what you already have. These molds have a tiny cup at the bottom that catches the drips which helps prevent sticky hands. I chose to use watermelon and strawberries, because those are two of my favorite fruits, and they are super healthy. It turned out great, and the kids absolutely loved them. First, you chop your berries and watermelon into large chunks. I just chop the top off the strawberries and cut them in half. You can easily scoop the watermelon out in chunks with a spoon. You do not have to dice it small or use a special melon baller. Leave it in big chunks and let the blender do the work. Tip: You will want to get a seedless watermelon, or to try to remove the seeds manually before you blend it. Next, add two cups of watermelon and two cups of strawberries into the blender. Add a small squeeze of lemon, if you’d like a little extra tartness. Then, blend until it is a thick liquid. 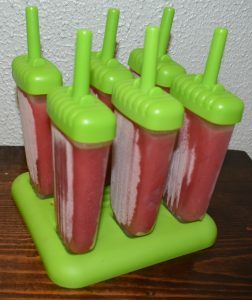 Finally, pour the fruit mixture into popsicle frames and let them freeze overnight. Important: Leave about a half an inch at the top for the liquid to expand when it freezes. They will look like this when they come out of the freezer. Unless you are the Hulk, do not try to immediately remove them from the mold. Wait about a minute or run a little bit of water over them, and they will slide out easily. These all-natural 100% fruit popsicles are the perfect healthy sweet treat! Cut fruit into large chunks. Pour into popsicle mold leaving space at the top for the fruit to expand when frozen. **As always it is best to calculate your own macros as they vary using different brands and apps. 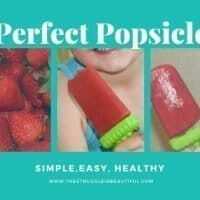 This all natural fruit popsicle recipe has limitless healthy possibilities. I hope you love them! Please let me know what fruit combinations are your favorite in the comments below. Feel free to check out some of our other healthy recipes here.